The Bison took the W in their first game of the season. Fans fill the stands, dressed in purple and gold and excitement on their faces. Band, Belles, cheerleaders and football players are ready for the rush of Friday night lights to begin. 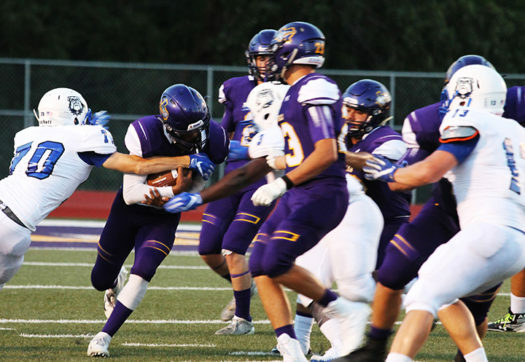 After counting down the days and anticipating their first game for months, the thundering herd took on the Crockett bulldogs on August 31. The boys finished the game with a 33-28 victory over the bulldogs. Crockett did not lose without putting up a fight. During the first half the bulldogs were in the lead by about 15 points. During half time the 61st line performed to Rocky, played by the marching band. To open up their showcase, the band played Handclap led by drum majors Colby Menefee and Omar Almeida. The cheerleaders led on many cheers throughout the game, in hope to pump up the crowd.